In this time-management thriller, you will be Warren Baker, the new bouncer of the prestigious club The Box. After spending three years in jail, you just want to live an honest life and recover your daughter. However, the quirky clients of The Box will drive you closer to your turbulent past, involving you in a gangster scheme that threatens to destroy everything that you love. Every night, among the club’s visitors, you’ll find undercover cops, annoying celebrities, runaway criminals or ghosts from your past. As the new gatekeeper of The Box, you decide who enters and who doesn’t... by any means necessary. Be careful though, because each choice you make can influence the fate of the club and its clients. You’ll also need to keep your salary to avoid being evicted, to see your daughter again, and most importantly, to regain control of your life. Will you let teenagers into the club in exchange for money? Will you confront a wealthy client to save his girlfriend when she asks you for help? Or will you work with the police to bring down the most powerful gangster in town? Everyone’s lives are in your hands. Only you choose how their stories end. 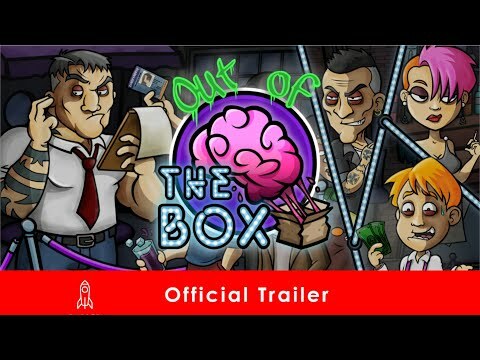 Out of the Box was released on Xbox One 227d ago in the US and the UK. Notify me when Out of the Box is available.